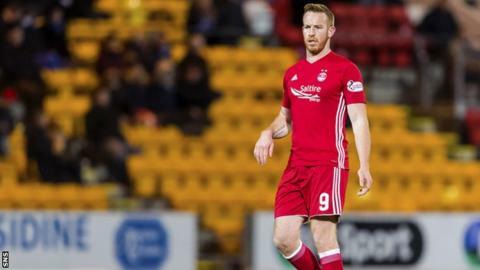 Aberdeen striker Adam Rooney says the team can build on consecutive clean sheets as they try to overtake second-place Rangers. The 29 year old scored his first goal since September in Wednesday night's 3-0 win over St Johnstone. That leaves Aberdeen third on goal difference, and Rooney says not conceding is key to their challenge. "That was something we prided ourselves on, being very hard to score against and that sets us up," Rooney said. "We have always got players on the pitch and in the squad that can get us a goal and we are confident of scoring at least one, so if we can keep clean sheets then brilliant." Aberdeen have enjoyed an upturn in form since manager Derek McInnes turned down the opportunity to take charge at Ibrox, with a 1-0 win over Dundee preceding the victory over St Johnstone and ending a run of only one win from their five previous games. The Pittodrie side now face a difficult run of fixtures, beginning with hosting Hibernian on Saturday and then travelling to face Celtic the following weekend. At the end of the month they play host to Hearts, while their first league game after the winter break is a trip to Ibrox, but Rooney says that self-belief is growing within the squad. "Confidence is in the team and we are looking good," said Rooney, whose game against St Johnstone was his 450th senior appearance. "We know it is going to be a difficult game but hopefully we can get a good crowd and get them another three points. "It was a real team effort against St Johnstone. From the front, everyone worked their way back and defended the way they needed to and going forward we passed the ball from the back very well. "We were patient when we needed to be and at the other end we created the chances that we had to do and we took most of them."